In 1964, in the midst of the spy boom (triggered by the immense success of the fresh James Bond series), NBC drafted in Robert Vaughn and David McCallum to star in light-hearted espionage series, The Man from U.N.C.L.E. The show was a hit - running until 1968 with 105 episodes, a Stefanie Powers-fronted spin-off series, and nine television films. As is customary with any vaguely successful property, now comes the big screen cinematic remake. 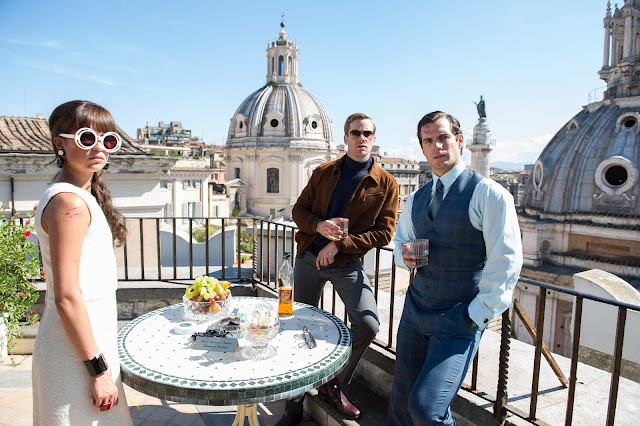 Guy Ritchie directs the project which puts Henry Cavill and Armie Hammer in the central roles - with impressive results. In the middle of the Cold War, CIA agent Napoleon Solo (Cavill) and KGB agent Illya Kuryakin (Hammer) are recruited by U.N.C.L.E. (United Network Command for Law and Enforcement) to stop international criminal Victoria Vinciguerra (Elizabeth Debicki) from detonating a nuclear bomb. The American and Russian's only lead is Gaby Teller (Alicia Vikander) whose father has been kidnapped by Vinciguerra and held prisoner in her Rome fortress. Like the original series, the tone of Ritchie's reboot is refreshingly light with an emphasis on humour amidst the action pieces and glamorous sixties nostalgia. This essentially feels like the Bond film that Ritchie has always wanted to make - with more in common with the likes of the later Sean Connery and Roger Moore films, U.N.C.L.E. is a welcome return to a time where spy films were colourful and outlandish. From the bold reds and fast-paced graphics of the opening titles intercut with Cold War context, it's clear that U.N.C.L.E. is set to be the filmmakers most aesthetically ambitious piece to date. From the lavish gowns and trim sixties outfits of its leading ladies to the finely pressed three-piece suits of Cavill's Solo - this is a watch that exudes sumptuous glamour. Like U.N.C.L.E's cinematic inspiration, the Bond films, this is a feature that showcases its nostalgic class in decadent hotel interiors and luxurious Roman locales magnificently captured by DoP John Mathieson. Ritchie's directorial eye is showcased in a number of finely crafted action scenes, usually always laced with a tongue-in-cheek humour. Opening with a search-and-rescue mission in East Germany anchored by an amusing car chase between initial enemies Solo and Kuryakin, Ritchie proceeds to feature speedboat pursuits and a countryside set dune buggy/motorcycle chase amongst his vehicular set pieces. These scenes are never too heavy, yet there's enough ambitious style and cheeky humour for us to be invested and amused. Whilst its narrative can feel somewhat poorly structured - occasional scenes can lack peril (a raid on a secret warehouse, particularly) or a sense of natural storyline progression, there is nonetheless oodles of charm to be found in Ritchie and Lionel Wigram's screenplay. There's certainly a freshness to be found in the simplicity of the 'agents hunting for a nuclear bomb' thread, that allows U.N.C.L.E. to find its sense of likeably camp nostalgia (elegant villainesses, F1 races, Nazi doctors, and electrocution, all play their part) and ensure the feuding character dynamic between Solo and Kuryakin gets strong central focus. Cavill arguably delivers his first genuine star turn in U.N.C.L.E., excelling at capturing Solo's smooth-talking American charm. This is a performance brimming with confidence and charisma, as well as just the right amount of schmaltz to get away with even the most heavy-handed innuendo. 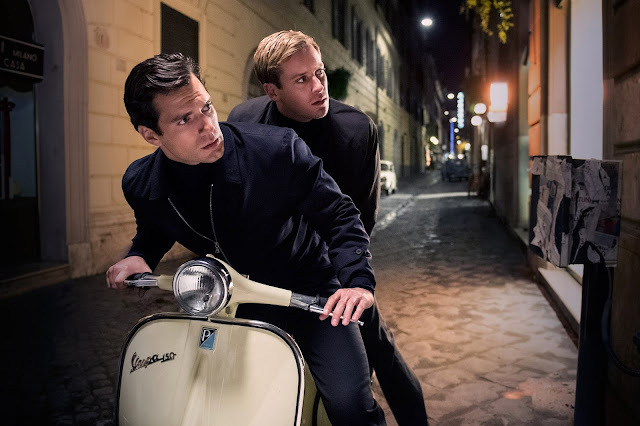 Hammer finds humour in the 'straight-man' role by playing up to the steely Iron Curtain demeanour of Kuryakin, with the interplay between the stiff Russian and smooth American showcasing the best of Hammer and Cavill. Vikander continues to showcase her exceptional screen presence, with the quick-witted and effervescent Gaby giving her male counterparts a run for their money. Debicki is deliciously hammy as the glamorous yet calculating Vinciguerra, whilst Hugh Grant steps into the Leo G. Carroll role of U.N.C.L.E. chief Waverly with his eternally-charming British gusto. The Man from U.N.C.L.E is this year's stand-out summer blockbuster. Brimming with charm, glamour and excitement, Ritchie has delivered a joyous romp that takes us back to a time where spy films were exciting, colourful and outlandish. Career best performances from Cavill and Hammer ensure that the fiery Cold War interplay of the original series is kept alive and remains incredibly amusing.